District 1 – St. Paul has clinched a playoff spot. Even if the Indians lose to Sedan and West Elk defeats Madison, the Indians will still finish in the top two in district margin points. West Elk qualifies as the runner-up with a victory at Madison. Sedan must win at St. Paul and hope for either a West Elk loss or a West Elk narrow victory in order to reach the postseason. If Sedan wins and West Elk loses, the Blue Devils are district champions. District 2 – Oxford has delivered an incredible turnaround from a 1-8 record last year to a district championship this season. The Wildcats defeated Peabody-Burns (44-28) and Cedar Vale-Dexter (58-42) in consecutive weeks. Peabody-Burns will host Cedar Vale-Dexter with the winner qualifying for the playoffs as the district runner-up. District 3 – Burlingame is the District 3 champion as the Bearcats have won their first five district games including a 66-20 win over Clifton-Clyde in Week 6. The Bearcats travel to Herington (4-1) this week, and even if they lose their marginal points will be the highest in the district giving them the title. If Herington wins by more than 7 points, the Railers are the district runner-up. If Herington wins by 7 points or less, Clifton-Clyde still qualifies. Clifton-Clyde (5-1) has completed its district schedule and must root for a Burlingame win over Herington to safely qualify as the runner-up. District 4 – Osborne is the District 4 champion with an unbeaten district run. The Bulldogs host Lincoln this week. Solomon visits Victoria in a key game in solving the district runner-up spot. The Gorillas can clinch the second playoff spot with a win. Even if Solomon loses they may still qualify as long as Logan-Palco defeats Bennington creating a three-way tie for second. If that’s the case, Solomon would likely either get the runner-up by virtue of having the most marginal points or because of their head-to-head victory over Logan-Palco should the two tie in marginal points. Victoria can extend its long playoff streak by defeating Solomon coupled with a Logan-Palco loss to Bennington. District 5 – Central Plains has won the district title going away with a two-game lead heading into the final week. Four teams are still in the running for the runner-up spot. Even Ellinwood (1-3) can get in with a victory over Canton-Galva coupled with a Goessel loss to Central Plains and a Little River loss to St. John. District 6 – South Central will travel to Attica this week to take on the Argonia-Attica Titans with the District 6 championship on the line. The winner is crowned the District 6 champions, while the loser qualifies as the runner-up. District 7 – Defending champion Spearville is the district champion and winner of 21 consecutive games. Ness City will travel to Leoti-Wichita County with the winner qualifying as the runner-up. Wichita County has enjoyed a successful first season in 8-Man football having posted the school’s most wins since 2008. District 8 – St. Francis has clinched the district title out of District 8. 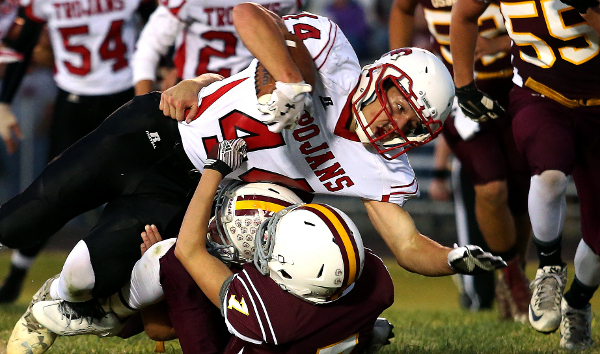 Atwood-Rawlins County can clinch a playoff spot by winning at Hill City this week. A Hill City win coupled with a Hoxie loss to Oberlin-Decatur Co. will give the Ringnecks the runner-up spot. Should Hill City and Hoxie both win, a three-way tie could result with marginal points deciding the second playoff spot. Should that occur, Atwood-Rawlins Co. can finish no worse than +42, Hill City no better than +42, and Hoxie no better than +37 – thus Hoxie has already been eliminated. District 1 – Lebo (5-0) is the district champion by virtue of the Wolves’ 34-26 win over rival Waverly (4-1) in Week 5. Waverly advances as the district runner-up with wins over Pleasanton (3-2) and Colony-Crest (3-2). The winner of Pleasanton and Crest could tie Waverly in the standings (should the Bulldogs be upset by Altoona-Midway), but Waverly holds the head-to-head tiebreaker over both teams. Waverly will travel to Hartford in the first round of the 8M-II playoffs. The Bulldogs lost to Hartford 60-14 in the season-opener. District 2 – Hartford (4-0) has clinched the District 2 title as the Jags hold the head-to-head tiebreak over Caldwell (3-1) and Hutchinson Central Christian (3-1). The Blue Jays and Cougars will meet this week in Hutchinson with the winner advancing to the playoffs as the district runner-up. District 3 – Hanover (4-0) is the District 3 champion after blasting Wakefield 54-8 last week. Wakefield (3-1) still qualifies as the runner-up by virtue of wins over the two 2-2 teams Axtell and Frankfort. The Bombers defeated Frankfort 44-40 in Week 6 and Axtell 54-6 the following week. District 4 – Determining the qualifiers in District 4 is simple. Pike Valley is the champion having posted a 4-0 district record thus far. The runner-up spot will be decided in Mankato this week where the Rock Hills Grizzlies will host Beloit St. John’s-Tipton. The winner of that game advances into the second playoff spot. District 5 – It’s extremely unusual to have as many as five teams still eligible for a playoff spot entering the final week of the season. But that’s exactly the scenario in District 5. Stockton hosts Lakeside-Downs with the winner qualifying as the district champion. After that, it gets complicated and will likely come down to the points system as there will likely be three teams tied with a 3-2 record in district play. District 6 – Our staff believes that District 6 was far and away the most difficult in this classification this season. Four of the six teams in the district were ranked in the Kpreps Rankings at some point this season. But as we enter Week 9, both playoff spots have already been determined. Unbeaten Dighton has won the district by going unscathed through four district games. The Hornets hold the tiebreaker over Sharon Springs-Wallace County (3-1) by virtue of a 42-32 victory back in Week 6. Wallace County qualifies as the runner-up as the Wildcats have defeated both Otis-Bison (28-20) and Hodgeman County (48-28). District 7 – South Barber is the district champ with a 58-12 victory over Chase. Chase can clinch the runner-up spot with a win over Ashland. Should Ashland win and Pretty Prairie lose, the Blue Jays would be the runner-up. If both Ashland and Pretty Prairie win by at least 21 points, a three-way tie could result triggering additional tiebreaking procedures. If that occurs, Pretty Prairie could get the playoffs spot as they enter this week with the best overall record with 5 wins. District 8 – Ingalls has clinched the district championship by virtue of a wild 62-58 win over Minneola in Week 6. Minneola is the runner-up as the Wildcats have shut out both 2-2 teams, Moscow and Rolla, the past two weeks.